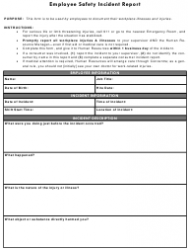 An employee incident report is a document used for reporting any issues or accidents occurring in the workplace. These incidents might include illnesses, injuries, property damage, etc. The incident can be reported even if it did not cause damage, but had a potential to do so. 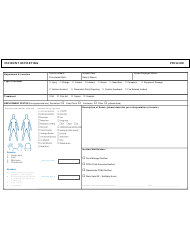 An incident report form is completed by the participant of the incident and their supervisor and usually contains information about the reporting employee, the time and place the incident occurred and provides a detailed description of the event. 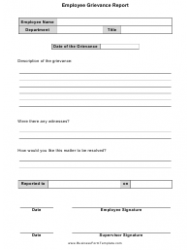 A report may have physical evidence attached to the actual form - such as photographs, slips or checks - and may contain names of the people involved people or witnesses. 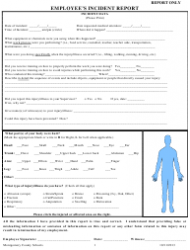 If the report contains a description of an injury or illness, the participant of the incident should authorize the release of their medical information for the sake of the investigation. 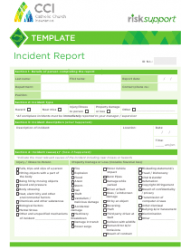 Incident reports are necessary for identifying hazards early and preventing serious damage and help facilitate the process to ensure that all necessary information will be provided. 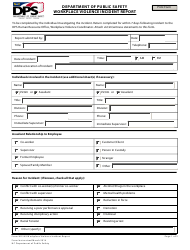 It is important to file a report as soon as possible to compile all the information related to the event. The completed report is submitted to the supervisor. After the supervisor reviews the report, the issue is investigated and corrected. The final step is to prepare recommendations for preventing future incidents.